The Answer To All Your Questions | Polish Me, Please! Well, the answer is- Happy April Fools Day! And thanks to Cynthia from Of Life And Lacquer for making that graphic back in the day. I’m NEVER getting rid of it. I’m sure you all knew that wasn’t for real but hey, it was fun trying to trick ya. Did any of you pull any pranks today? My big question is where did the pic of the shark nails come from? 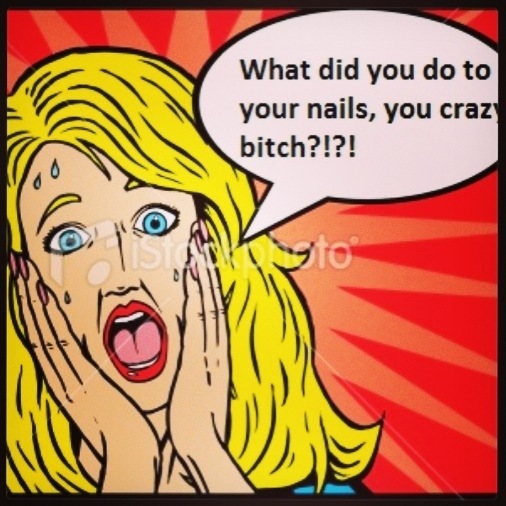 I was praying you hadn’t really done that to your nails. hahaha Although, I’d probably think you are awesome if you did do it. I found it on like a billion weird beauty sites… So basically I stole it since I could not find the actual owner. I totally would trash my nails in the name of outrageousness tho! !